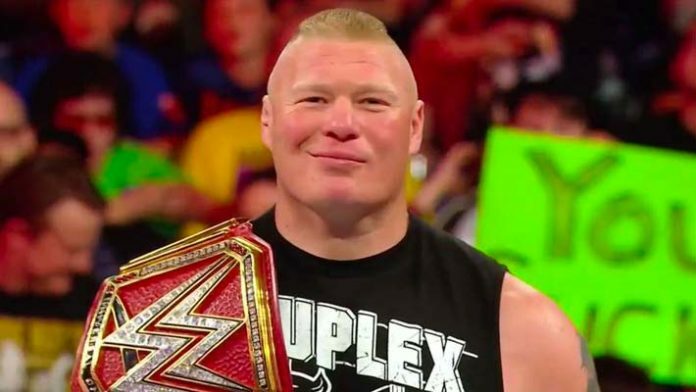 WWE Universal Champion Brock Lesnar is expected to drop the title soon. It was noted in a recent report by Justin Barrasso of Sports Illustrated that Lesnar is set to be dethroned as champion either before or at SummerSlam. It was also mentioned in this report that when it does happen then it could be a big indication that it will be when he’s out of the sports entertainment company and potentially headed back to the UFC. It’s well known that Lesnar is not slated to compete at the upcoming Money in the Bank pay-per-view next weekend. Thus, WWE could have him drop the title at the Extreme Rules event in July or SummerSlam in August. There have been rumors that WWE could pair him up against Braun Strowman or Roman Reigns but that has yet to be confirmed. Who do you want to see be crowned the next Universal Champion? Sound off in the comment section below. The current WWE Universal Champion surprisingly retained his title against Reigns in the main event of the biggest event of the year for the sports entertainment company, WrestleMania 34, in April. The expectation at the time was that WWE would crown Reigns the new champion as it was reported that Lesnar would be leaving the WWE for another stint in the UFC. Shortly after this event, it was revealed that Lesnar had signed a short-term contract with the sports entertainment company. He was last seen at the Greatest Royal Rumble pay-per-view event where he retained his title against Reigns in a Steel Cage Match.